Whoa .. i havent been productive in the kitchen lately. I have been hit by the virus called "LAZY". Last Thursday and Friday, I attended some Stress Management Course - "Stress Management through Body Awareness" by Bob Feldman. It was total relaxation. After course on Friday, I managed to catch up with an old fren, Su and we kinda went coffeeshop hopping .. hehehe. Though the meet up was short, we had a good time chatting. Su, if you are reading this, we sure gonna do it again sometime right?? Anyways, back to cooking. 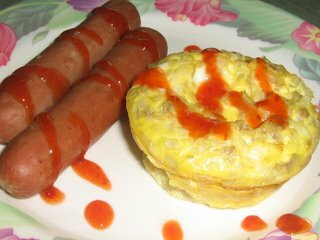 I prepared something simple for breakfast today, ie. Eggs and Sausages. Hmm .. i know how unhealthy it is to eat processed food eg. sausages, but hey, these are nice comfort food. So as not to feel bad about it, I baked the eggs instead of frying them. Preheat oven to 180C and grease 6 one cup muffin tins. Pour into the muffin tins. Bake for about 30 mins till cook. Serve baked eggs with boiled sausages. If I have the time this week, I will be sharing an overdue post Baked Corn Pudding which I baked two Thursdays ago but havent had time to update. Watch out this space again for the updates! Bicycle, So Old Skool ..